As I’m sure most of you already know, the Department for Transport recently made a decision to increase the speed limit for HGVs on single carriageway roads in Britain to 50mph. One of the arguments made for this policy was that of safety. The intention is to reduce the speed differential between HGVs and other motor traffic from 20 mph (the difference between 60 mph, and 40 mph – the previous limit for HGVs) to 10 mph. It is asserted that this will reduce the temptation to overtake HGVs in dangerous situations. It is true that this change will bring the UK more into line with the Netherlands, which has a higher speed limit for HGVs of 80km/h (~50mph) on single carriageway roads. 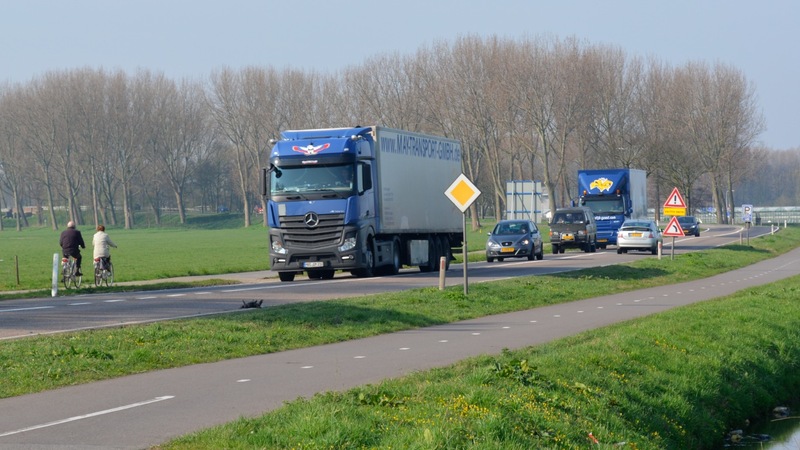 However, I would like to argue that this change – this reduction in speed differentials between HGVs and other motor traffic – should form just the start of a comprehensive approach to road safety that reduces danger for all road users, based on the Dutch system of Sustainable Safety, or Duurzaam Veilig. Rather than just one isolated measure, the UK should bring its entire road network, and the way it is designed, into line with the Netherlands. Sustainable Safety is all about prevention – preventing crashing from occurring, and, secondarily, reducing the risk of serious injuries when collisions do occur. One of the core principles of this approach is homogeneity – equalising, as much as possible, the mass, speed and direction of vehicles, to reduce collision risk. In particular, fast objects should not share space with slow ones; and vehicles travelling at speed should not be travelling in opposing directions, without separation. Likewise measures should be taken to separate bodies of unequal mass; for instance, heavy vehicles like buses and lorries should be not be sharing the same space as pedestrians and cyclists. The basis for this approach – and other Sustainable Safety measures – is that human beings are fallible, and that the environment we travel in should respond to that fallibility, rather than expecting us to not make mistakes, ever. Although this approach is only a few decades old – launched in the early 1990s in the Netherlands – the Dutch have made great progress in applying Sustainable Safety to their road network. They have removed speed differentials, reclassified road types, and improved the forgivingness of their roads and streets. SWOV estimate that, from 1998 to 2007, Sustainable Safety measures had reduced the number of deaths on Dutch roads by 30%, compared to a situation in which these measures had not been implemented. Meanwhile Britain languishes far behind, with a road network totally unsuitable for the few vulnerable users who are brave enough to venture onto it. 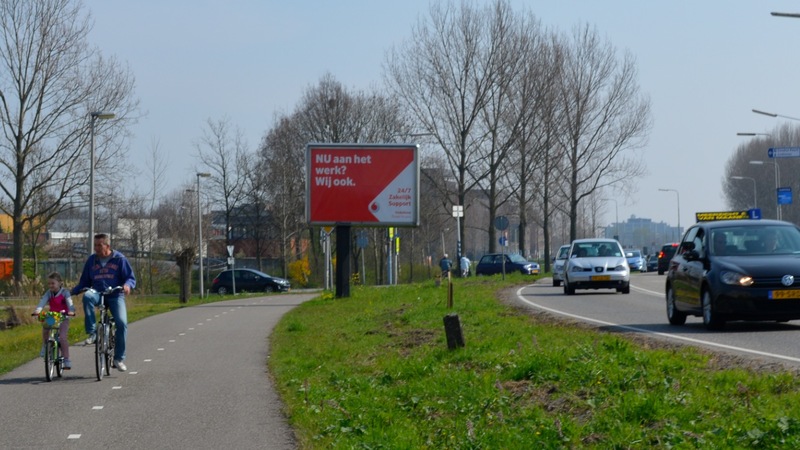 The contrast with the Dutch road network – open to all users, of all ages and abilities, regardless of their mode of transport – could not be more stark. As it happens, in raising the HGV speed limit on single carriageway roads to 50mph, the DfT has, accidentally or otherwise, made a tiny, tentative step towards applying Sustainable Safety on Britain’s roads – the speed limit differential between HGVs and other motor traffic has been reduced. But this is, plainly, nowhere near enough. Sustainable Safety principles should instead be applied comprehensively and consistently across Britain’s road networks, ensuring that all road users are travelling at similar speeds, and that if they are not, that they are provided for separately. What would this mean in policy terms? Speed limit differentials between all forms of motor traffic should only exist where vehicles have an opportunity to overtake each other safely, without coming into conflict with oncoming traffic – on motorways and dual carriageways, or where specific overtaking locations are provided, with central reservations, or barriers. Overtaking should be performed in lanes with motor traffic travelling in a uniform direction, rather than in lanes which carry oncoming motor traffic. It is absolutely essential that this uniformity of speed of motor traffic on the road network is accompanied by the provision of high quality, separate routes for road users that travel at substantially lower speeds – people walking, cycling, and riding horses, as well as agricultural traffic. It is not at all appropriate for these users – generally travelling at no more than 20mph – to travel in the same space on single-carriageway roads as vehicles travelling 30mph faster or more; or indeed in the same space on dual carriageways, which have even higher speed limits. Not only would the construction of these separate routes greatly increase the safety of these vulnerable road users, they would also serve to make the journeys of motorists safer, smoother and less stressful. This universal 50mph limit should apply on main roads, with a 40mph limit elsewhere. As with the reasons set out above, this uniformity is on the grounds of homogeneity of speed, and again serves to reduce the temptation to overtake dangerously. Naturally enough, I am coming at this issue from a cycling perspective, but I hope it is clear from the above proposals that these measures would benefit everyone who uses the road network, either on foot, on horseback, on bike, or at the wheel of any kind of motor vehicle. It would make journeys by foot or by bike considerably safer, and far more pleasant, but just as importantly the same would apply for journeys being made by motor vehicle. The stress of having to deal with overtaking slow-moving agricultural traffic, or people cycling, would be removed. Journeys would be smoother, safer and more predictable. It would also genuinely reduce any (legal) incentive to overtake HGVs in situations where specific overtaking opportunities have not been provided – all motor traffic would be travelling at approximately the same speed on these roads. Only on roads designed with safe overtaking opportunities would different categories of motor vehicle have different speed limits. We would have a humane road network, that is safe for all, rather than the current one that effectively excludes the vast majority of users who aren’t travelling in motor vehicles. In addition, it would make the journeys of people in motor vehicles safer, and more straightforward. This needs to happen. That’s why I have started a petition calling on the Department for Transport to develop and implement these policies for Britain’s roads. I hope you can sign it. *In some limited circumstances, a 60mph limit for all motor traffic could be retained on single-carriageway roads (for instance, long distance routes where higher speeds might be justified), provided design measures have been put in place to eliminate the danger of head-on or crossing conflicts. I’ve signed it and shared it. It’s why I’ve moved from England, Transportational Cycling is effectively banned for my and my kids in England. There are various national speed limit single carriageway roads around me that have lots of features that you’d think would encourage drivers to slow down (such as bends, narrowness, lack of centre line or hatching between lanes), but that doesn’t appear to slow people down. What kind of features might make a differences between 50 and 60mph? Are there Dutch examples? Hi @justacwab I believe in NL speed limits are set to be no higher than is safe, as part of Sustainable Safety. In addition, keeping limits deliberately low on country lanes discourages rat running, the by product is more direct short and medium distance journeys by bike are often quicker in terms of time than by car, on unravelled, quiet routes. So what happens on the country lanes I cycle on? On the quieter B roads? Or the quieter country lanes I walk on? You either have to build a completely new network of special cycle tracks (which pedestrians can use ) or you have to slow motor vehicles down to 20 mph , or probably less, on all of these roads. And I mean ALL. As far as I’m concerned if motorists can’t cope with slowing down to wait for cyclists or pedestrians in spaces they come anywhere near them, then tough on them. I see no reason to collude with their refusal to behave properly. Also, do you seriously think that going along with measures like the speed limit increase for HGVs is actually going to make it easier to have either cycle tracks along every single road that has more than a 20 mph limit or 20 mph with good compliance on all the other roads? Have you read the last two policy points? No, it’s tough on the active traveller who gets put off cycling, injured or killed by that inability to cope. That’s simply the reality of cycling in the UK at the moment, no matter how much you have the magic bullet(s) that will solve all problems. You don’t have the gun to fire those bullets. I’m not sure Mark has the gun or bullets with this either, but exactly because I’m not sure, and because there is doubt over efficacy in the application of any intervention in the UK, I am prepared to give him the benefit of doubt, and support the petition. I presume you didn’t. But if you set up a petition I’d probably sign it. I’m afraid we simple theory-free bike riders are like that. Dutch country lanes without any form of cycle lanes, even painted, are typically 60kph, or 37mph. True, that’s a little faster than in towns, but more importantly however, is that these are usually not through roads for motor vehicles but only for access to small hamlets or farms, hence traffic volumes are extremely low. Through traffic is physically forced to use parallel N-roads (80kph or 50mph) which in any case, everyone would choose to use because they’d be faster. Not like here in Britain where country lanes can be used as rat runs, at 60mph no matter how narrow or twisty-turny they are. This clearly indicates that cyclists can be expected and makes the road feel quite a bit tighter. Through traffic actually generally uses motorways, or sometimes autowegs, which are 100 km/h roads that are even faster, often with full interchanges, and are generally single carriageways, sometimes divided. Regional traffic uses the 80 roads. Usually 80 km/h traffic is coming from one part of the province (around the same size as the counties of the UK) to another part of it. Solving the problem by reducing the speed differential is the soft option. Separate the HGVs from high flows of other traffic in *time*. Let them go gangbusters any time between midnight and 5am on any non-residential road, but *not at all* outside of designated A roads, dual carriageways and motorways at any other time. If we can’t have a comprehensive separated cycle network, let’s use that comprehensive heavy road network to keep the big stuff out of the way. HGVs could be allowed to run at higher speeds in this small hours window, with whatever marginal gains the industry can squeeze from that. For the most part, the people who stand to get hurt are people from the industry. Increased numbers of LGV vehicles carrying urgent, divisible loads can match commuter acceleration and speed, increasing traffic flow, lower skilled employment and reducing wear on the road and associated costs. Road junction geometry can be made tighter to reduce speeds and make the ped/cycle experience better in town centres. Lighter vehicles are closer in scale to vulnerable users and have fewer ‘blind spots’. White van man becomes an ally. Necessary HGV traffic (indivisible large loads) and night time optional HGV traffic (divisible loads benefiting from economies of scale) are separated completely from faster moving commuter traffic and vulnerable users, becoming instantly safer and attracting lower insurance premiums. Vehicles could be electronically timelocked or GPS monitored for an extra discount. 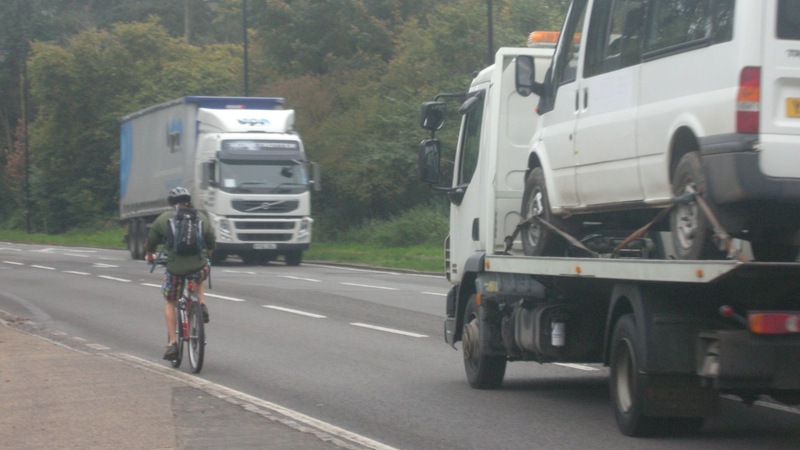 Optional daytime HGV traffic is disincentivized by the need for a transfer to lighter vehicles at the ‘road head’, improving the opportunity for alternatives such as rail, cargo bikes, etc. Policing is easy and could largely be conducted by existing cameras. Owners, as well as drivers, could be walloped impartially and without malice by automated fines or other consequences for infringement. If we’re shocked by how short-sighted the Cons policy is, why not shock them back with something measurably better? And you make a good point about reducing speed differentials between vehicles sharing the same space to create a humane road network and encourage people to travel actively, discouraging people from traveling in modes that damage and harm. To that end I’d prefer to see all vehicle speeds lowered rather than agree to raise the speed of HGV’s. This is the case especially in towns where there will always people people walking and cycling even on A roads. Speed on these roads should be reduced to 20mph (which is something that is happening in London even on some A roads -The City of London is now completely 20mph). I also agree that much need to be done to discourage drivers overtaking when there is not enough room which may be possible with some changes in road layout, and very strict enforcement through cameras and severe punishments and fines for dangerous behavior while in a motor vehicle. Your proposal accepts the motor centric status quo and asks to remove active travelers from our road network which may not be feasible in many circumstances. We need to make driving hard, slow, expensive and anti-social If we are serious about getting people to travel actively and in a manner that doesn’t continue to pollute our planet and cause pollution related illness and blight. I am not suggesting raising the speed limit for HGVs in towns. This is specifically about single-carriageway roads that *already have* the national speed limit, i.e. where motor traffic has a 60mph limit, and HGVs have a 40mph (soon to be 50mph) limit. On these roads I am suggesting that all traffic should have a 50mph limit, with separate provision. Urban areas already have 30mph (or 20mph) limits, and are therefore something else entirely. Note also that I am arguing that where it is not feasible to separate people walking and cycling from motor traffic, that motor traffic should be displaced to alternative routes. What about rdrf’s point about country lanes and quiet class B roads where the national speed limit is 60mph (and would be 50mph were your idea to be implemented)? That is too high. You argue about speed differential, then surely you should be calling for lower speed limits on any road where people are allowed to walk along/cross or cycle. We need to get people to stop driving for lots of reasons (Health, blight, pollution, noise etc) and provide alternatives such as improved public transport. We need to ensure that people are happy to walk/cycle everywhere and have a national speed limit to allow this. Of course where people can’t walk or cycle like on motorways, then drivers should be able to drive faster, perhaps there is also a case for inter-city trunk roads (were high quality separate cycle/walking provision is provided, however when these roads go through our towns and cities where people live work and shop, then speeds must always be low enough to eliminate the differential between cyclists and drivers and they should be designed to facilitate ease of pedestrians crossing, even explicitly let drivers know (by law) that active travelers always have priority. I am – “This universal 50mph limit should apply on main roads, with a 40mph limit elsewhere.” And this accompanied by measures to displace or remove motor traffic, as I hope is clear from the post. And to repeat I am not suggesting changes to 30mph/20mph speed limits in urban areas. I would have thought country lanes and quiet B roads would be exactly the kinds of roads that would be used for the network for slower traffic, including bikes. So, if we followed the Dutch example I would anticipate the freedom I have enjoyed there where I even saw a group of kids skateboarding the 3 mile distance between two villages. I can’t imagine that in the UK as things stand. Obviously they knew what I was discovering – that the network for slower vehicles had much less through traffic than in the UK. I think we are getting very hung up on what kind of speed limit exists and where. In principle, drivers should travel at the safest speed for the conditions. 40, 30, or even 20 might be too much in given situations. Taking a guideline for design that on single track roads, the speed limit should be 20, on B-roads it should be 40 and on single carriageway non-trunk roads it should be 50, with 60 on trunk singles and 70 on dual carriageways, actual speeds should be inherent in the design and layout of the road in question. Couple this with stricter liability. Engineers design roads to the likely, rather than posted speed limit. In this circumstance we have drivers consistently exceeding the speed limit as a matter of course and little or no chance of prosecution. I suggest that in fact speed limits are a red herring and there is no such thing. Drivers travel at the speed they can get away with, compensating for safety measures by increasing their risk thresholds. I don’t understand why engineers design 20mph roads to be driven along at 26mph to, as one put it to me, “allow a margin of error”. Or why a junction TfL is about to build on Leatherhead Road at the southernmost tip of Kingston to allow margins for error in response to regular right turn “accidents” will plainly result in higher traffic speeds than before, coupled as it happens with no cycling infrastructure whatsoever save ASLs. This despite the alleged “new dawn” for cycling. It seems that the response to danger is to allow people to have a larger margin in which to create more danger, just in case there is some danger, clearly a self fulfilling prophesy, and by the way to further exclude vulnerable road users because of the increased… You’ve guessed it already. The correct response, to make our roads safer, to my mind, is to change the design of our roads, softly, subtly, but definitely to bring speeds down to the desired level and to include the margin of error within the speed limit “budget”. Removing centre lines, not cutting back verges, creating narrowings by removing bitumen and allowing verges to extend over, not putting in kerbs, allowing trees to grow, filtering out rat runs, will make the difference, some wouldn’t even cost anything. Take two villages in South Devon on a main road. Both have a 20mph limit. One has a narrow hilly street with varying width, with a nominal “pavement” marked on the carriageway with green anti skid that reduces much of the road to single track. There are walls and hedges hemming in the road from both sides and sight lines are poor. The other village, a mile further on has a wide road, a footway on one side, solid double white line markings and the only limit on speed is a sign at each end and some painted roundels on the road. Through which village do people drive at below 20mph? I agree with the sentiment of equalising, or coming closer to equalising, speeds. Raising speeds of HGVs, however, is the wrong way around. We should be lowering speeds of all motorised traffic as David says. I frequently drive on a B road and am constantly amazed at the speed that people drive at, whether in cars or in HGVs. The road is full of blind curves and very tight spots. People still drive very fast. The result, of course, is accidents with high frequency. The number of cars hitting trees, other cars and deer is incredible but people still do not slow down. Sigh. This road would be lovely for cycling (and I do see some people doing so) but I wouldn’t dare. That is what I am suggesting though – the speed of general motor traffic should be lowered from 60 mph to 50 mph. There are two ways to make roads safer for all users, take most of the terrible drivers off the roads or…make the roads more forgiving and segregate where speeds are higher than 20mph and cyclists should have their own space. You get really bad drivers in Holland, same as anywhere, but the roads are much more forgiving…. for vulnerable users who are largely kept away from fast moving traffic. Changing things like the speed limit, signs and paint rely on drivers to actually keep to the rules. I think the sustainable safety plan in the UK relies too heavily on drivers doing what they are meant to do, whereas in the Netherlands if they want you to slow down, they will damn well make you slow down and they keep vulnerable users away from heavy traffic. There are lists of measures that have made travelling safer in the Netherlands that in the UK are ignored in favour of expecting people to just behave themselves. 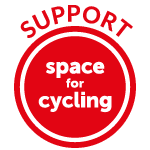 If this petition is anything, it’s a call to the UK transport authorities to implement actual realistic measures, using actual infrastructure changes and not just changes to the speed limits – limits that people largely ignore. I guess a good place to start would be on some of the single carriageway roads that are quite wide. The A441 going into Birmingham from the M42 is a good example with ample space to create a separate cycle track. I agree so with that the rules need changing in a good way taking some road rights away from slower traffic. Grown up in Holland so I know what it is like to cycle safely and respect motorist/hgv’s and get respect back. 50 miles roads should have separate paths next to it for cyclists/moped/scooter, as the speed difference is to great to be save. HGV should be allowed 50 as well as that makes that the traffic flows better. 60 mile (not sure if there are any) minimum speed 35 miles. this blocks any access for cyclist/pedestrian/moped/scooter even tractors. as the rules goes you should be able and allowed to go a minimum of 35 miles. Separate the tractors to prevent bunch ups they could create a b road for slower traffic. 70 miles or higher minimum speed of 45 miles able and allowed. as with 60 miles prevents a lot of stuff. In my opinion a lot needs to change in the mentality of both cyclist and motorist for the UK to become a good cycling country. I am against taking road rights away from cyclists and pedestrians. I don’t think motorised traffic users fail to behave properly in the vicinity of other road users of all types (but particularly pedestrians and cyclists) because cyclists/pedestrians may not “respect” them (whatever is meant by “respect”). These are the two points you ask if I have read. My problem is that I don’t think “measures to displace or remove motor traffic” actually deals with a lot of, if not most, motor traffic on the rural B-roads/country lanes that I cycle on. Nor do I think that a 40 mph limit, even with compliance, deals with a lot of the danger from motors. Danger from motors can be addressed by engineering vehicles (installation of black box crash recorders through to automatic speed control, ped/cyclist activated braking, whatever), enforcing the law, generally reducing use of motors, as well as engineering the highway. And of course, from simply having commitment from motorists to watch out for cyclists and pedestrians, which can be done to a large extent simply by them wanting to. Drivers are capable of being a lot better than they are – but the society we live in does not require/expect them to. Of course, this requires cultural change – but then cultural change is required to do the kind of measures you ask for. And I think they are a rather clunky, roundabout way of getting adequate safety for cyclists/peds. Most of all, I think volunteering to lose rights is a disastrous thing to do from a position of weakness. I absolutely don’t think that offering to get off roads will lead to the powers that be supplying a radical provision of adequate alternatives. I also think that pushing the idea that cyclists don’t belong on (our) roads near motorists is asking for trouble when we will have to be near motors on most roads. Going along with getting cyclists out of what drivers may think is “their way” is a very dodgy thing to aim for. So if a situation was built like in the 2nd and 3rd photo, you would still cycle on the main carriqage way out of fear of ‘losing your right to the road’? As a Dutchman, I find that totally incomprehensible. AND blocking progress in the fear of losing ‘the right to the road’ is also very selfish towards less able-bodied persons. >blocking progress in the fear of losing ‘the right to the road’ is also very selfish towards less able-bodied persons. How much pollution and noise are the man and boy being exposed to cycling next to that busy main road in picture 2? > How much pollution and noise are the man and boy being exposed to cycling next to that busy main road in picture 2? Well, a lot less actually than if they would be cycling on the main carriageway, and they’re exposed to a lot less stress too! It would be great if we would/could transport ourselves all by human power, and public transport, but for long distance travel, that’s simply not feasible/efficient enough that people will want to do so, so I don’t see cars disappear anytime near in the future. I prefer not to be used as a traffic calming device, especially not on 50+ mph roads; I would prefer cycling on a path like picture 2 any day, and would rather see that car drivers are at the same time less annoyed by cyclists, see that cycling can be nice and convenient, and in that way influence them to “give up their `right’ to get around by car”. Erm, less than they would be if they were cycling in the carriageway. And of course that man and his young daughter wouldn’t be cycling at all if they had to do that – they would be making their trip by car instead, producing more pollution. Seriously, how wrongheaded is it to imagine that the solution to getting people to drive involves *not* providing attractive conditions for cycling? Seems like an example of ‘making the perfect the enemy of the good’. In an ideal world (i.e. if I were Generalissimo Absolute Dictator of the Planet!) that traffic simply wouldn’t exist, along with all the noise and pollution which, as you point out, it still produces even in the presence of good cycle infrastructure. But in reality the kind of separation seen in the picture is both the best we can hope to get, and furthermore, offers the best chance of reducing the level of motorised traffic. To reduce that noise and pollution you have to reduce the level of traffic, and to do that you have to provide people with a palatable alternative to driving i.e. decent cycle infrastructure. Additionally, I don’t think the presence or absence of bikes on the road really makes much difference to the experience of driving on it – what makes driving unpleasant is other cars, so removing bikes from some roads will not do much to make driving more appealing – just as long as fast, useable, bike lanes are provided. I get your point, David, traffic calming is indeed one of the ways to go. But I think there will be no reducement of car traffic if there is no better alternative offered. Yes, it’s not nice to cycle along such a busy road. That’s why there should be cycle ways all over the country, so as to have a choice, and preferably an unravelling of the car grid and the cyling grid. To make a place low in car usage you will have to make detours for cars, or, if you really want to go about it more brutally, make using or owning a car nearly impossible. That would make you right popular. The solution is never as simple as 1 person can think up. You will need a really fine grid of bike lanes, cycle tracks, greenways, quiet streets, blocks against rat running, bypasses around town centres, all kinds of dedicated bicyle infrastructure, along with thing such as livable streets, parking at public transport points, education, etc. etc. Any one of these all by itself will keep things just as they are. Or perhaps you are a visionary, having a grand thought of a future with clean, noiseless transportation, which features lots of bikes, excellent rapid public transport and green open living streets. I can relate to that David, but the steps in between just have to be taken. There is no shortcut to experience. And that’s the point, surely. Make the provision more direct, more convenient, just *better*, and the point becomes moot. You don’t have to “take away” any right to the road, because using the road isn’t as good an option. The problem here (UK) is that cycle provision is poor, in pretty much every way it can be. It’s poorly designed, it’s poorly maintained, it’s poorly linked, both to places people like (or have) to go, and the rest of the network. Even new facilities are this way – one is being built on my commute which will force users to cross two lanes of busy traffic midway through, in order to use a pavement shared with pedestrians (because two lanes of bidirectional motor traffic will not be restricted in any way). Lots of people have pointed out that this is a hugely inappropriate design for what is a pretty busy route – it’s going in anyway. Those who use it will be inconvenienced, those who don’t will experience the hostility typical of British drivers, who will see the bike “facility” and demand everyone use it, on pain of punishment passes, tailgating, &c. It won’t increase cycling, because the inexperienced and those lacking in confidence will balk at the mid point crossing (as, to be honest, I do, when I think about it, and I’ve been riding this route for getting on for 8 years). The alternative roads carry more motor traffic, at higher speeds, with motorway entrance & exit roads along them. The council have, in effect, made a bad situation worse, despite being told that this is what they are doing. So yes, existing cyclists in the UK are defensive about “right to the road” and I think it’s an understandable position, because planners *aren’t* looking at best practice in NL &c and implementing it here. They’re putting in nonsensical designs that could only make sense to someone who’s never ridden a bike trying to get somewhere. The idea that this rubbish should have a contingent ban from the road attached galls, and rightly. Ultimately, the aim should be to make a “ban” unnecessary – the facilities should be worthy of the word, and be the natural choice for the journey. I agree with pretty much everything in the post (as usual). But regarding the petition (which I have signed anyway), the idiots making the rules don’t have a sustainable safety agenda, they have a “promote motor vehicle usage to help the economy” agenda. Of course this is wrong-headed, but it can be clearly seen in the ongoing fuel-tax freezes and so on. I hate to be the pessimist here, but I think trying to hijack hgv speed limit increases and expand that policy to better facilities for cycling (and/or walking) is likely to be a bit of a non-starter (to put it mildly). Metric limits would give traffic managers more options in this field. 40 mph could either be 60 or 70 km/h, or sometimes that might be too fast where 50 would be better, like in some urban areas. 60 mph could be either 90 km/h or 100 km/h. 70 could be 110 or 120, and 130 km/h limits should be introduced as options, as the actual speed is mostly not a factor, the differences in the speed is generally the cause of collisions, and some traffic at 113 km/h and some at 130 km/h means a considerable difference. If there were the paths built for slow traffic, incapable of 60 km/h, then the motorways and dual carriageways, and even some especially high quality single carriageways, similar to the N50 the latter two kinds of roads being what the Dutch would call an autoweg, could have a minimum of 60 and a top speed for motorways at 130 and for autowegs at 100 km/h. Note that these limits are rural limits not urban ones.